I had a very long but fun weekend. First was the Pulmonary Hypertension doctor appointment and an Arterial Blood Gas drawn. Then we ate lunch at McDonald’s because we had other things we needed to do. We had to run to Walmart to return some stuff and pick up some forgotten thing from the grocery trip K did the previous day. Plus we picked up a new inhaler at the pharmacy. That was all on Friday. When we came home from the errands, we got busy finishing up with cleaning the house because family was coming!!!! Yay! After I made it to bed feeling exhausted, I knew I had to get up way early again for another appointment on Saturday that was a little over an hours drive away. While we were at the appointment, my sister & her family already arrived at our house (we call it The Chateau), and we finally got home around 2pm. Yay! We got to babysit my niece for 4 hours, which was super fun but by the time they got back, K and I were wiped out. My niece must have some sort of super-charged mega-battery that keeps her pumped up with energy. I asked to borrow it but I didn’t think it’s transferable. Darn! We had so much fun but I’m glad we didn’t go to lunch with them today. It’s time for this girl to crash. I need sleep or at least down time. My niece is 7 and she asked me lots of questions (even taught me a two person hand-slapping song that was called Lemonade. I think?!) about my bipap mask that I was using when she snuck in my room to see if I was awake yet yesterday during my very short nap. She wanted her own cannula. She also wanted to see what it felt like with it connected to the oxygen. I always want to make sure that she knows it’s ok to ask questions about me or my equipment. Curiosity can be a good thing when paired with learning about something that will expand her mind. We had a great time this weekend and I feel happy as I always do when I get to see one or both of my sisters. It’s like medicine to my soul. Sounds a little corny but it works for me. Officially, it is Friday and Veterans Day. First, I would like to take a moment to say Thank You to all of men and women who have and are putting themselves in harms way to protect our freedom and our way of life. Many have sacrificed their life to give us the freedoms that we should never take for granted. We should always remember the price those men and women, throughout history, have paid for our rights and our freedom of choice. Last night I was super tired and ended up going to bed at 8pm only to have to get back up at 9pm to take my Tikosyn. Because, you know, that pill has to be taken every 12 stinkin’ hours! Argh! Fear not, I was still super tired and promptly fell right back asleep. That is, until now, 1 o’clock in the morning. I’m here under the covers in the dark bringing you my late, late, night ramblings of what happened to make me so tired. Yesterday, I had a doctor appointment. I got there a wee bit too early. I had to sit in my van for nearly 30 minutes because I wasn’t sure my portable oxygen tank would last long enough if I went in early. I have a 75 pound liquid oxygen reservoir tank in my van that I use to drive around on and to refill my portable. After about 30 minutes, I went into my doctor’s office for my annual physical. Yay what fun right? Actually, my family doctor is pretty darn cool! According to all the labs I had done about two weeks prior, it looks like I should live another few years, at least! My doctor was surprised at how awesome my cholesterol and other test results were. Yay! I can continue to eat my pop tarts! Haha! As usual, my bicarbonate was high and my chloride was low but my kidney is keeping my pH level in balance. Thank you Jesus! We did talk about pain management. Because my lungs don’t work as well as they use to (which wasn’t that great! ), my options for pain management is VERY limited. My scoliosis is getting worse in the lumbar area of my spine and causing right hip pain which can be horrible at times when I sit or stand too long. Taking a whole Tylenol3 pill (that has Tylenol and codeine) is far too much for my body to handle. I have to break the tablet into quarters and take a fourth of a pill at a time. Even that much sometimes causes a migraine and troubled breathing. Alcohol has the same effect on me now. Instead of being able to drink a glass or two of wine or alcoholic drink like in the past, I can only drink about 1/3 of a cup before my breathing is affected. I still pour about 1/2 inch of wine in a glass occasionally to drink but never go for refills. It’s just not worth it. I think it affects my heart too much which I think is causing the breathing problems. When I got home from my doctor appointment, I promptly took my diuretic medicine because I had to skip the morning dose. Then I dove right into making dinner, meatloaf, only to find out K will be late coming home. So instead of a full meal, we ended up eating meatloaf sandwiches. We love meatloaf sandwiches!! I’m not very good at being able to coordinate having all of the meal cooked and ready to sit down at the table to eat at the same time. I just don’t have that talent. haha! K is VERY good at it. He use to be a chef. No, before you ask, he does not cook on a regular basis at home. That’s my job. I don’t know where I went wrong in this scenario because he’s really good. For the rest of the day, I plan to spend time with K. I am thinking about making a batch of my famous peanut butter cookies. I don’t bake cookies as much as I use to because it’s become harder and harder to mix the cookie dough. I don’t have a heavy duty KitchenAide mixer but I’m hinting towards one for Christmas. I can only get so far with a hand mixer and the rest has to be mixed by hand. The hardest cookie dough I’ve ever had to mix are the Chocolate with peanut butter chip cookies. Next would be Oatmeal Scotchies. Both cookies I LOVE! There’s nothing like a homemade cookie, right? I’ve already started my next Need a Hug afghan. The last one was sent out to Jenny who lives here in the U.S. Click Need a Hug in the menu above to see how you can get your name on the list for one of my Need a Hug afghans. I hope everyone has a great day. Stay well and warm. It’s finally down in the 70s here! Keep in mind as you read this blog post that K and I are very experienced with traveling while loaded down with multi reservoirs of liquid oxygen. We are safe drivers and we take precautions before we head out on the road for vacation to ensure that our vehicle is in what we call, “Vacation Ready” mode. That means we take it to our favorite auto repair mechanic and ask them to look at our vehicle and make sure it’s ready for a road trip. We ask them to take a good look at the tires, brakes, belts, and to change the oil. They fix anything that needs to be fixed because we don’t want to be miles away from home and have car trouble. Thankfully, we have AAA (triple A roadside service) Membership. Everything we need for vacation, including medical supples. When we plan a vacation, there are a lot of factors that go into the planning. The very most important factor is the location of my DME company in relation to my vacation destination. We also take into consideration whether there are any Lincare’s along the way. For the ones along our route to and from our destination, we could possibly set up a refill for my liquid oxygen reservoirs by asking my local Lincare office to set it up. The Lincare that I stop at for refills have to have the capability to fill liquid reservoirs. Some Lincare companies no longer do liquid oxygen. This year we decided to find a beach that we’ve never been to before. We love the beach and for the past few vacations, we’ve only tried to rent beach house one other time. The only thing with this house that we rented on the beach was that it was on stilts. We didn’t realize the stairs to the house would be so darn steep. When we finally got the keys and drove the short distance from the office to our rental house, we pulled in and saw the stairs. We brought with us 2 – 100 pound reservoirs of liquid oxygen that weigh about 165 pounds full (but feel like you’re lifting a ton!). It took both of us, with K doing the lifting. I was standing behind him supporting his back with one of my hands pressed hard against him making sure he didn’t fall backwards. By the time we got that tank and the 75 pound reservoir up the stairs and into the house, we decided that the other 100 pound reservoir could stay in the vehichle since it was parked in the shade under the house. We were both sweaty and hot after that. It was so humid. We planned an extended vacation this year. My health has been declining. So, we both knew that I would need extra days when we arrived in Alabama and even in-between to adjust to the heat and humidity. It took me 2 days resting off and on before I could get outside and start having fun. K was super kind about not pressuring me to do anything that I didn’t feel like I could do. I arrived at the beach house with a migraine headache because the drive was stressful for me. The first day we drove we stayed overnight at a hotel. We came out the next morning and found one of our tires was flat from a piece of wood embedded into the side wall of the tire. Luckily, K had a tire air compressor in the back of the van and he aired it up enough to take it to a tire shop where he bought a new tire. The second day we drove, K stopped to fill the van with gas, it was my turn to drive this time. For some reason, as I was sitting there waiting for K to come back from the bathroom, the fuel light went on but the fuel gauge stayed at full. I don’t know what made me do it but I actually pushed the tripmeter to zero it out. At least I would know how many miles I’ve gone with the gas that I have in the tank. Anyway, the fuel gauge scared me by dropping all the way to EMPTY while K was a sleep. Ten minutes later, the fuel gauge would start raising back up to full and the light would go off. That was creepy scary. I let K drive after that. Apparently, there’s a wiring problem. Ugh! After I was ready to get out of the beach house, I hit the beach! Even from the wrap around porch of our beach house on one day, we could see a few dolphins swimming off the coast! It’s easy taking my oxygen to the beach. K had set up a tent with two beach chairs beneath it for me to relax and watch K wade into the water. When I wanted time in the water, K would either carry my portable on his shoulder and hold my hand as we walked into the waves OR he would have me connect my 50ft tubing to my portable and clip my portable to one of the beach chairs that he’d move closer to the shore. I’d bury the feet of the chair in the sand to give it more stability. I’d just need to sit my tank right in the seat with strap clipped to the top of the chair. Perfect! I could walk up to 50ft into the water or just sit on each of the tide. This is how I sit at the beach under a tent on low beach chairs. Rocco would sit with me while I crocheted on vacation. We went out to celebrate my 47th birthday and our 24th Anniversary! We really had a good time on vacation. We didn’t want to come home so soon even though we spent 10 days in the beach house. I think next time we are going to try to stay longer. It all depends on how well my health holds up. *fingers crossed* YAY! 2015 Happy Jar Revealed…. she opens the jar! 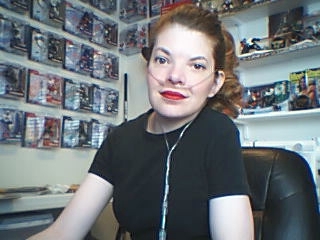 This post is more about becoming more motivated about living life while on oxygen. It has shown me that even though my year was filled with challenges, I still had many happy moments to add to my Happy Jar. This is the happy jar that I made for my 2015 Happy Jar project. I filled it with written down happy moments that happened for me throughout the year. I’m now reusing this jar for my all-exciting happy moments of this year . If you’d like to read about what Happy Jars are used for, click and read my post that I wrote titled, Happy New Year!! It’s nearly 2015!. Today, I dumped out the 2015 happy moments and started to read through them. Last year was a tough year for me. I struggled with motivation and breathing problems. With all of that going on, I didn’t think that I had slipped very many “happy” moments in my Jar. As I read through the “moments,” I found myself smiling while I remembered the fun and exciting times I had. This “Happy Jar” has been a great idea! In fact, I’m hoping to fill it up this year! I hope you created one for yourself last year with me. If you didn’t, start one now! It’s not too late. You don’t have to be super creative with your jar. Mine is a clean Spaghetti sauce jar that I ran through the dishwasher and then painted and used polymer clay to decorate it. Give it a try and do it your way! I thought I would share my happy moments with you. Let’s see how many I have. Maybe you will recognize some of them! Granted… not every happy moment of 2015 made it in the jar. It was fun pulling out the papers and reading the things I nearly forgot about that happened. ~ I just made a batch of Oatmeal Scotchies (cookies) and cleaned the mess. AND I’m not even tired from it! Hooray! ~ Results are back on the CT Scan. My aorta is only 4.3cm instead of 5.1cm. YAY! Whew! ~ Going to Oklahoma for 5 days for my birthday/anniversary! ~ I finished an afghan for my cousin’s baby! I love babies! ~ Made Rocco some doggy biscuits- homemade! He loves them!! ~ I finished the family Christmas photobook. I ordered an 8×8 book just for us to see how well it turned out. Can’t wait!! ~ My mother-in-law gave me a gift of a t-shirt that’s black with blingy cats. I LOVE IT! ~ Sore from painting last night. So, I made brownies as my motivational reward. Then, I continued taping trim and walls! Happy Day! ~ I finished my Happy Jar (added the cat on the lid) and made decorative papers for my Happy Jar! So Happy! ~ I sent an afghan to one of my parents! He wanted my name and date on it. Awwww! ~ I went to the doctor today to get the paperwork started for a new Bipap! Saw K at work, mailed a Need a Hug afghan, and then made dinner in the crockpot & cleaned up the mess. SUCCESS! ~ Family came for a visit and they tested out the Margarita Machine I got K for Christmas! Great weekend! ~ I’m so happy. K and I finished painting the family room walls, hung curtains, and pictures. Then cleaned our mess. It looks awesome!! ~ Klondike goes to Paris with sister and her husband. ~ Pictures are now coming in from Paris! Klondike is having a blast!!! ~ I finished Klondike’s Adventure in Paris photobook that I made for my sister as a thank you for taking Klondike on their vacation. A little bit of fun adventure! You know that every now in then, we really need something exciting to happen to give us a sense of adventure. I mean, if you’re like me, you spend a bit more time indoors than outdoors. So adventures can often be hard to come by. Don’t get me wrong. I seek out adventures wherever and whenever I can and when my next thrilling adventure presented me with an opportunity, I jumped all over it. Ok, I’ll be totally honest with you. This adventure isn’t exactly for me. Let me explain what happened… *cue dream sequence* A few years ago, K bought me a new rubber chicken, which I named Klondike, because my previous chicken, Mr. Chicken (God bless his soul!) passed on to the pearly chicken heaven due to a broken neck. Yeah, Rocco got to him. Darn that dog! Klondike is much different, yet so similar to, Mr. Chicken. He’s similar because when you squeeze him, he screams but he’s also different because, Klondike is far more adventureous. If something exciting comes along, he jumps on it. Go Klondike, go! 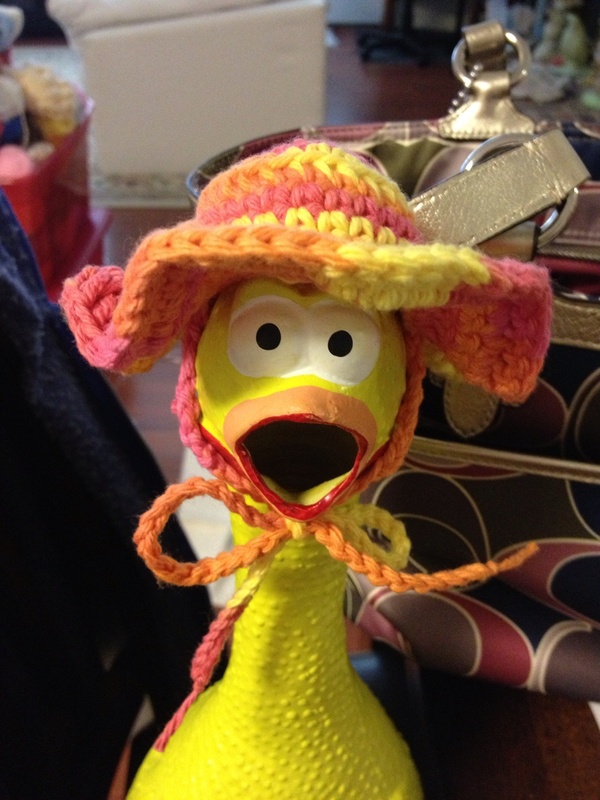 He even wears a crocheted beach hat that I made him! He’s stylin’! An Aorta measurement update since the CT Scan. Canulas, what kind are available to you. A Need a Hug update… So exciting! My garden progress… I can’t believe I got something to grow! Want to know more? Let me know in a comment. ** I’ve noticed that my blog doesn’t show the YEAR of each post. That’s why I’m placing the year now at the bottom of the posts. You know… in case you were wondering. haha! I hope you are having sunshine where you are! *love and hugs* to you all. Be well!